LG Group chairman Koo Bon-moo in his New Year address on Jan.2 hailed the "auspicious" anniversary year ahead, urging staff to help LG prosper until its 100th and beyond as a company customers trust and a firm with a strong entrepreneurial spirit. LG plans no sumptuous party for its birthday. In reality, the mood is somber, chiefly because of sluggish sales of flagship subsidiaries LG Electronics and LG-Philips LCD. Yet its last 60 years have been full of achievements. 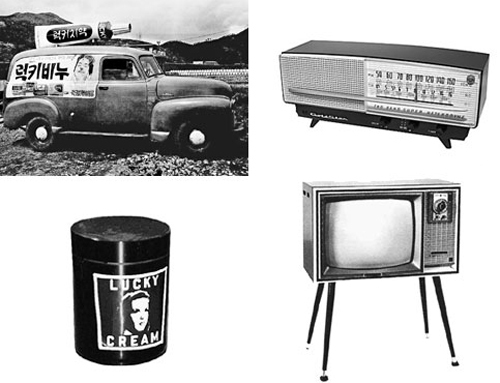 The first product Lucky Chemical Industrial produced in 1947 was Lucky Cream. It came in a brown container bearing the image of the Hollywood starlet Deanna Durbin and boasted such a sophisticated design that many people mistakenly thought it was imported from Shanghai. In 1951, the company entered the plastics business to make cosmetics containers and succeeded in developing less brittle kind of lid for them. The company ushered in the plastic age in Korea, introducing plastic combs, soap cases, toothbrushes and tableware. In 1954, it made Korea's first toothpaste brand, Lucky Toothpaste, and three years later, in 1957, it beat the U.S. brand Colgate to top the market here. Gold Star, the predecessor of LG Electronics, was founded in October 1958 and also became a pioneering firm. In November 1959, the company manufactured the first made-in-Korea radio, marking a turning point in Korea's electronics industry. Since then, the company also made the first fan, automatic telephone, refrigerator and washing machine. In 1966, it introduced HiTi which later became a leading detergent brand. Its innovative spirit led to interesting developments. HiTi put an end to the need for Korean homemakers to beat clothes with washing paddles. The washing machine further lightened the load. When first introduced, the company's black and white TV was so sought after that people formed long queues to buy it. LG started its business in 1947 with a capital base of W3 million(US$1=W926). That has grown to W7.565 trillion today, growth of more than 2.5 million times. Revenue has grown 270,000 times, from W300 million in its first year to W80 trillion last year. In its first year, 20 workers produced Lucky Cream at a 180 sq.m workshop. Today the staff is 7,000 times bigger, numbering 140,000. Export has grown exponentially, too, from 62 radios sold in the U.S. worth US$ 4,000 in 1962 to $40 billion last year. Korea's economic miracle would have been impossible without companies like LG. The group holds several records, not only in statistics but also in the history of corporate management. In 1957, for the first time among the nation's private firms, LG held an open recruitment to hire employees. The listing of Lucky Chemical in 1969 was also the first initial public offering in Korea. In 2003, for the first time among large conglomerates in Korea, LG launched a holding company, LG Corp. The spin-off of the GS Group was also a landmark that smoothly ended the co-ownership of the Gu and Hur families that had lasted for 57 years. "The company has been a pillar of the Korean economy over the past 60 years," LG executive vice president Chung Sang-kook said. "It will grow into a top-notch company that prospers over 100 years, as chairman Koo has promised."